Interested in St. Linus School? 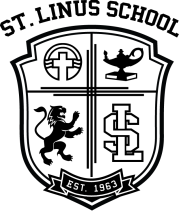 St. Linus is a private Catholic preschool-8th grade school accredited by WASC and WCEA. We welcome students and families from all faith backgrounds. We have started fundraising with scripsense! You can help contribute to our organization all year long simply by shopping! To get started, email ichacon@stlinuslions.com and request a registration link. Once you receive your email from scripsense, click on your personalized link in your email to register. Shop for eGift cards or shop online and a percentage of every purchase goes back to us. It’s that simple! You have the power to help our organization by embracing a lifestyle of giving. We really appreciate you giving back! NEW ﻿St. linus spirit wear - Available now!